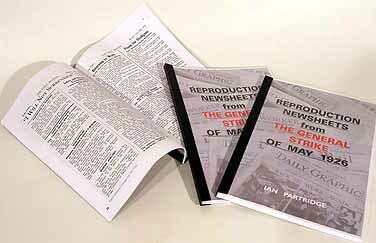 - 52 - page booklet with colour photograph illustrations and A4 size facsimile pages of several 'Strike Emergency' editions, including unique papers wanting from the British Library newspaper collection. Unique research and background reader material. 'Daily Mirror' of Friday May 7th, 1926. A single sheet issue with photographs. "FIRST PICTURES OF THE GREAT STRIKE IN LONDON" "Printed for and published by the Daily Mirror Newspapers Ltd, 23-29 Bouverie Street, London, E.C." 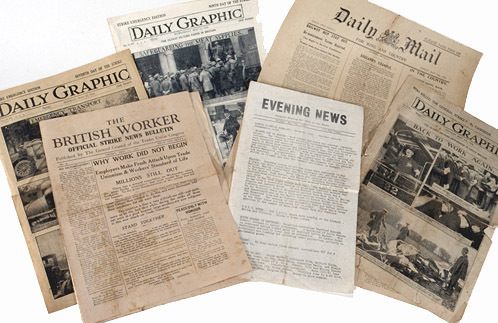 “’British Gazette’ - the Chancellor of the Exchequer is to be asked by Commander Kenworthy on Tuesday whether he can yet state the cost of publishing the Government newspaper, known as the British Gazette, what amounts have been received from sales and advertisements, and what compensation is to be paid to the Morning Post newspaper”. With a pasted-in caption ‘ BACK TO WORK AGAIN’ above a photograph of a smiling tram driver testing his gear before leaving the Camberwell Depot, and queues of men signing on for work. www.Ian-Partridge.Com ~ Web page content photography and design ~ Copyright ©2011 ~ 2019 Ian Partridge.